In 1959 John Glenn orbited the Earth. He was one of seven men picked to be a part of a space program called "Project Mercury" owned by NASA . then the third most dangerous feat to orbit the Earth all the way around succesfully. 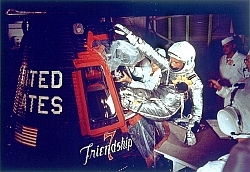 On February 20, 1962 John Glenn climbed into a tiny capsule called the "Frendship 7". In just 90 minutes he already was ready to land because he had orbited the earth... but then they had a technical difficulty,the heat shield had collapsed and he remained calm even in this condition of extreme danger. He knew that if he tried to re-enter Earth's atmosphere his ship would catch on fire and collapse. Four hours 55 minutes and 23 seconds later he safely landed in the Atlantic ocean. When he got out he exclaimed "The view was tremendous". I imagine he was right about the view, it probably was tremendous. At first, I was wondering why they picked him and not the other seven men? So I looked it up on a National Space and Administration (NASA) website and according to NASA he has received the Distinguished Flying Cross on six occasions, and holds the Air Medal with 18 Clusters for his service during World War II and Korea. Glenn also holds the Navy Unit Commendation for service in Korea, the Asiatic-Pacific Campaign Medal, the American Campaign Medal, the World War II Victory Medal, the China Service Medal, the National Defense Service Medal, the Korean Service Medal, the United Nations Service Medal, the Korean Presidential Unit Citation, the Navy's Astronaut Wings, the Marine Corps' Astronaut Medal, the NASA Distinguished Service Medal, and the Congressional Space Medal of Honor. He also went to primary and secondary schools in New Concord, Ohio. He attended Muskingum College in New Concord and received a Bachelor of Science degree in Engineering. Muskingum College also awarded him an honorary Doctor of Science degree in engineering. He has received honorary doctoral degrees from nine colleges or universities. That might explain why he was chosen to be the first man to orbit around the earth. Join in and write your own page! It's easy to do. How? Simply click here to return to Homeschool Laudo Lydia Interactive.